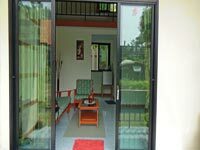 This new, small apartment house is located in Bang Khao, a quiet residential area in the south of the island of Samui, near the well known Samahita Yoga Retreat. The beach and restaurants are within a few minutes walking distance. Small shops are in the near surrounding and big shopping centers are in the near by Lamay as well as all kinds of bars, pubs, and entertainment for everyone. The apartments offer a comfortable living area with lounge, Sat-TV and computer desk on the lower floor. A small breakfast kitchen and the bathroom adjoin this room. A stair leads to the open upper floor where you find the double bed, a wardrobe and the air conditioning. Two small terraces in the front and in the back and the communal pool complete this accommodation. 14. Apr - 29. June 01. Sept.-14. Dec.
11. Jan. - 30. Apr. 16. Jul. - 15. Sept.
21. Dec. - 10. Jan. Transfer can be arranged by request.